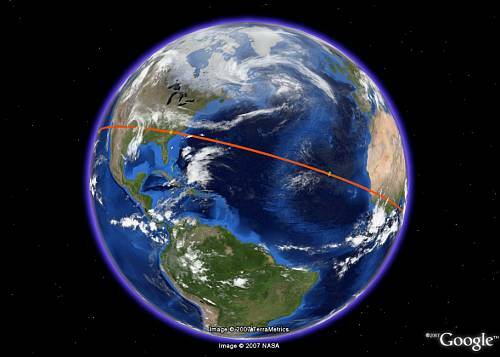 Google Earth Blog: "If I Go in a Straight Line Around the Earth, Where do I Pass?" "If I Go in a Straight Line Around the Earth, Where do I Pass?" Last year, Google mashups started appearing showing where you would end up if you dug a hole through the Earth. And in March I wrote about a simple Google Earth network link which let you do the same thing in Google Earth. Well, one of the web sites which did this for Google Maps, has now come up with another interesting little mashup. It is all based on the question: "If I walk in a straight line around the world, where do I pass?". The interface is simple, just click on the Google Maps on their site to set a starting point, then click the little flag to get a prompt to tell it what direction you want to go. You end up with a Google Map showing the path you would go if you went around the world. Since Google Maps is a Mercator (or cylindrical) projection the straight path looks curved when the curved Earth is laid flat. If you click on the Google Earth view of the same path, you'll see your path is straight when viewed in 3D. via GoogleMapsMania. (By the way, the clouds and Earth overlay comes from the Blue Marble 2.0 add-on). Shameless promotion: Yet another feature that's been in EarthBrowser for over 3 years. I've been doing this, sort of, for the last several years in Google Earth. I place my eye at about 50,000ft., and tilt so the horizon is showing, then I do a grab/fling to set myself on a trip around the world, with no idea what I'll fly over. Try it!